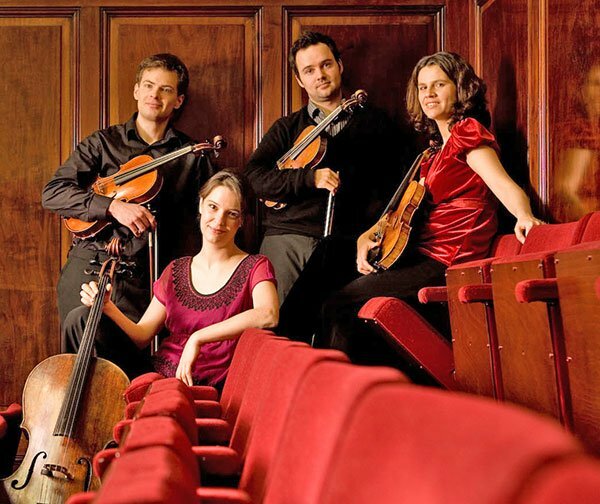 If earthquake and fire made no biblical visitation in Sandy Bay last night during Elias String Quartet’s Rockport Music debut, the almighty voice of Beethoven nevertheless sounded with precision and distinctiveness. In this golden age of string quartet playing, spectacular chops no longer suffice: possession of a personal sound and interpretative philosophy stand as the major differentiators of one group from another. The London-based devotees of Elijah brought an astonishing quiet intensity to a rapt house; not a cough was heard, and indeed the visceral silence reached such a minus level that a cell phone on vibrate (this just had to come at the reverent final bars of the Heiliger Dankgesang movement) provoked widespread annoyance. More pianississimo playing we have never heard. Overall, the foursome disclosed its own brand of artfully hesitating lyrical impulse—unanimous to a fare-the-well, of course, but also possessing freshness and wonder. This was that rare ensemble that sounded in person even better than on its excellent recordings. To a work from each of Beethoven’s three periods, they voiced a seemingly contradictory shy exuberance, rising as needed in power without ever turning gritty or unrefined. In the analytical acoustic of the Shalin Liu Center, the affect was impeccable. The Adagio affettuoso ed appassionato movement from Op. 18, No. 1 best epitomized first violinist Sara Bitlloch’s impulse to dedicate the concert to memory of the Paris bombing victims. Opening with a quiet expectancy, the musical prayers swelled into a profoundly longing memorial to the executed Parisians. With restrained soulfulness rather than pumped-up sobbing, cellist Marie Bitlloch spun out the sorrowful theme—and the performance was better for that artistic restraint. And the variations seared as a consequence of the earlier restraint. These players never oversold or pushed, rather they let Beethoven’s meditations come to us directly. Note to my executors: this is what I want for my funeral. The scherzo’s alternating figures somehow subordinated to the quartet marriage with less strife than many interpreters evince, but some sharp elbows still contended. Where other quartets merely raced, the Elias found songful brightness and unabashed individuality. The final allegro flew past in a surpassingly glittering and mercurial span. Scales and runs were at the same time purposeful and perfect. This movement most epitomized the group’s sound: delicacy underpinned with spine. Perhaps an early music clarity, but it arrived with nuance, winks, long lines and impossibly long Luftpausen. In the steadiest soft playing imaginable, the introduction to Op. 59 No. 3 almost blinded us with vibratoless quiet intensity until the andante moto(r)ed in un-agitated excitement under seemingly endless slurs, though clarified by tremendous subtleties of articulation. Sarah B’s brilliant mini-cadenzas never over-matched the other players, including Marie B’s rapidly speaking cello; the latter’s heartbeat pizzicati through the second movement were the most varied and interesting we have ever heard. And in that quasi allegretto, the operatic outbursts of the upper strings supported an angelic aria from the first violin. The menuetto spun as if on ball-bearing turntables—with nary a galumph. The concluding fugue raced fearlessly, catching its breath in a sumptuous ritard before emphatically concluding the most satisfyingly and electrically alert performance of a Beethoven quartet that I have ever heard. Op 132 began with an otherworldly, caged agitation, and perfectly channeled all of Beethoven’s valedictory mood swings. If this foursome avoided some of the relentlessness that other foursomes bring to late Beethoven, they perhaps failed to stress its modernity. And I’m not sure I could detect any changes in playing style as works from the three periods unfolded. Some of that may be due to how the Shalin Liu Center seems to bottle-up the sound. In a different space we might have heard more amplitude, and diabolic craziness, but all night long we nevertheless felt an irresistible compulsion to listen in to the awestruck, elegiac elegance of a major foursome.